When is the last time you purchased a car or a mattress because of a digital ad or any ad for that matter? In fact, when is the last time you walked into a jewelry store, furniture store, or auto dealership and just threw down your credit card and said, “I’ll take that one.” It doesn’t happen unless you are a celebrity showing off on one of those “I’m super rich” shows on MTV. Outside of commodities like cleaning supplies, which are often purchased online, big purchases are discussed with a salesperson and made in person. But something is amiss because retail, and specifically automotive, are the largest spenders on advertising. Digital advertising is the most advanced form of marketing with its ability to bid on analyzed content and to place personalized interactive creatives. The advancement of digital advertising makes sense, given the exodus of consumers from the physical store (foot traffic dropped by half or if you don’t subscribe to WSJ, click the first article here) to online (now 5 hours and 46 minutes per day). And the purchase of a commodity, like diapers, is highly influenced by advertising and often purchased online with a click to a banner ad potentially playing a crucial role in your decision-making process. But I’m not talking about diapers. What I am talking about are the majority of dollars we spend. 93.6% of retail purchases are made in brick-and-mortar stores. I’ll say it again for people who work in digital and continue to ignore this fact: 93.6% of retail purchases are made in brick-and-mortar stores. Of the 6.4% of retail that is eCommerce, 50% are going to sites that have physical stores (i.e., Apple, Home Depot, Best Buy). So if the purchases are done in store, then the digital ads certainly cannot be direct response. Oh, they must be branding ads. Wait, then why are all of the advertisers looking at click through rates and conversions? Regardless of whether the goal is branding or direct response, it is not the best use of technology, media, or money. The best use of money for any retailer is selling. Marketers have begun to understand this as marketing dollars have shifted toward social media in an attempt to build a relationship between the brand and the consumer. The next step is obvious and important: build a relationship between the salesperson and the customer. 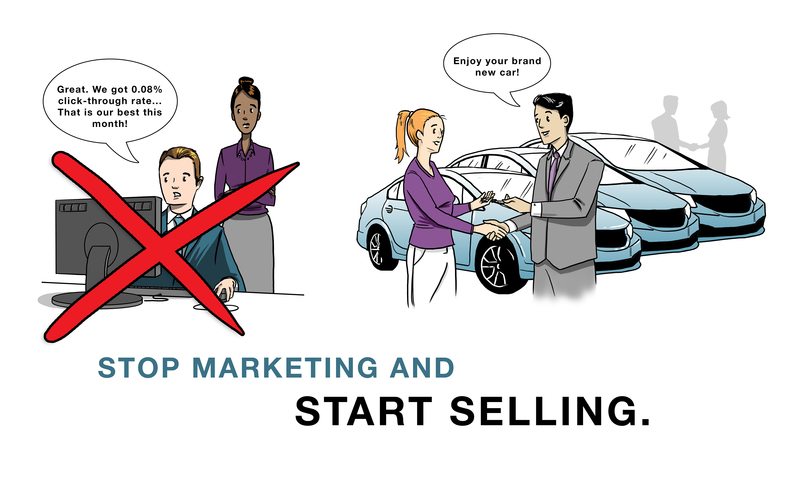 Use that same dynamic, targeted, and personalized technology to connect a real person looking to purchase a product with an actual salesperson who is located nearby who sells that product. I try not write about my own company Purple Cloud in my blog so I will limit it to just one sentence: this is what we do.